Konkan Railway Corporation of India, Udupi division, organised an awareness workshop for schoolchildren at T A Pai English Medium High School over the risks involved at railway level crossings as part of International Level Crossing Awareness week, recently. Officers and safety managers at the Corporation explained using crossings safely and highlighted the risks of passing railway level crossings. Karwar Dilip Bhat, senior operating manager, safety, said that incidents at level crossings are a regular occurrence in the belt. 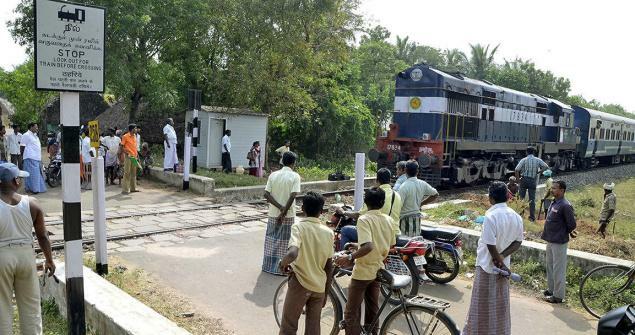 He advised students to always approach the level crossing gate with extra vigilance. One should not try to trespass the vehicle from beneath or beside the gate barrier. Level crossings that cannot be closed would be made safer and events will be held to create awareness among schoolchildren, motorists, cyclists and pedestrians about the dangers and how to stay safe, Bhat said. Vinay Kumar, regional traffic manager, Mangaluru, said that level crossing incidents are avoidable if people obey the warning signs and signals for their own safety. He said that every near-hit-and-collision on the rail network causes severe trauma for train drivers and other railway employees involved. The railway industry organises awareness campaigns as level crossing collisions are consistently shown to be the direct result of driver behaviour and failure to observe warning signs and signals. The behavioural improvements among the public can only be achieved through spreading awareness, he opined.